Mackenzie Uhlenhopp received her Bachelor of Arts degree from Central College in Pella, Iowa, and music therapy equivalency from the University of Iowa. She worked at Methodist hospital in inpatient, oncology, and home hospice settings and at Struthers Parkinson’s Center as part of her 1,040-hour music therapy internship training with Park Nicollet Health Services in Minneapolis, MN. Mackenzie has provided music therapy services to a wide variety of clientele throughout Iowa and Minnesota, and is particularly passionate about working with adults with Parkinson’s disease and other neurologic disorders as well as with those with dementia and Alzheimer’s disease. Mackenzie is a member of the American Music Therapy Association, Midwest Regional Music Therapy Association, Great Lakes Region of the American Music Therapy Association, and Music Therapy Association of Minnesota. Mackenzie frequently uses her harp in music therapy to address client pain and anxiety, and to assist with relaxation and emotional expression. She uniquely utilizes playing of the harp to address diminished finger dexterity, flexibility, and independence; finger and hand coordination and strength; and hip, arm, and shoulder range of motion. These targeted, rehabilitative goals are a natural element of using the harp within a music therapy context as opposed to harp therapy or a therapeutic musician using the harp. 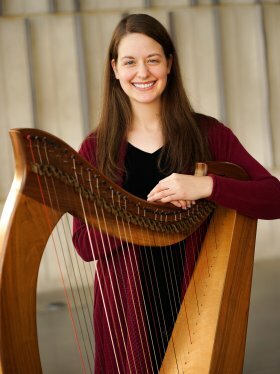 Mackenzie is continually astounded by the power of the harp and of music therapy to help all kinds of people improve their quality of life and she looks forward to continuing her work with Living Spirit Therapy Services.